Much like the French and Indian War, the War of 1812 is yet another forgotten and overlooked war. 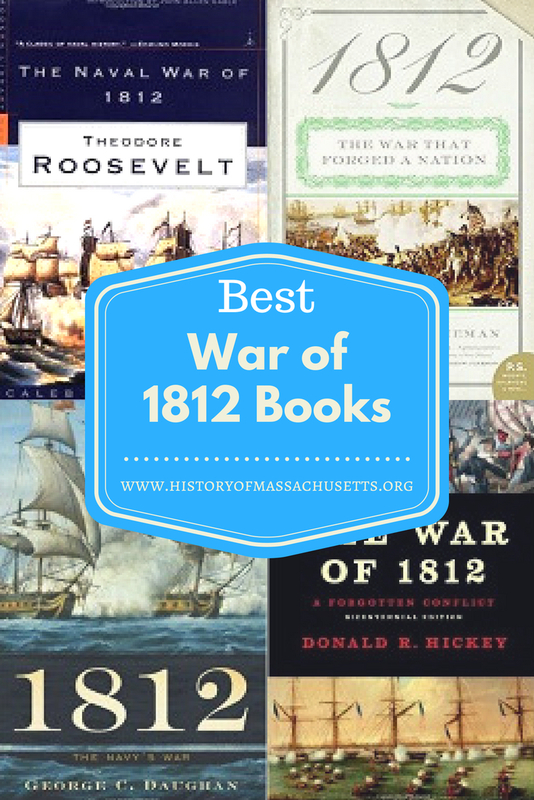 As a result, there aren’t as many books on this war as there are on the American Revolution or the Civil War. The handful of the books that do exist are great but there are also many bad or mediocre books too. This can make it hard to figure out which books to read. To help you out, I’ve compiled a list of what I think are the best books on the War of 1812. These books all have four to five star ratings on sites like Amazon and Goodreads, they are best-sellers in their niche and they have great reviews from publications like the Washington Post, the New York Review of Books, the Guardian and etc. Published in 2011, this book discusses the navy’s role in the War of 1812 and how the many naval battles shaped the war. Daughan argues that these battles prove the navy played an important role in the fight for America’s independence. George C. Daughan is an award winning naval historian who also wrote another notable book about the navy titled If By Sea. Daughan, who now resides in Portland, Maine, is a former professor who taught at a number of academic institutions including the Air Force Academy, Connecticut College, University of Colorado, University of New Hampshire and Wesleyan University. Daughan won the 2008 Samuel Eliot Morrison Award for his book If By Sea and the 2012 gold medal in the Independent Publisher book awards and the 2012 George Pendleton Prize for his book 1812: The Navy’s War. Daughan has a PhD in American History from Harvard University where he studied under Henry Kissinger. Published in 2010, this book discusses how the War of 1812 redefined America and renewed the struggle between the Americans and Britain for control over North America. Taylor argues that the War of 1812 was a civil war that almost split the country and the North American continent in two. The book details how the war almost caused New England to seceded from the United States. The book also discusses how, in Canada, the war pitted loyalist American immigrants, who had fled to Canada after the Revolutionary War, against recent American immigrants, who held anti-British sentiments and were pro-American independence, as well as against recent Irish immigrants, who already held anti-British sentiments prior to the war. In addition, it created a tough situation for Native-Americans in the U.S. who found themselves drawn into a war where neither side cared about their rights or well being. Alan Taylor is an award-winning author who has written numerous books on American history such as American Colonies, The Internal Enemy: Slavery and War in Virginia: 1772-1832 and William Cooper’s Town: Power and Persuasion on the Frontier of the Early American Republic. Taylor earned a PhD from Brandeis University and is a professor of history at the University of Virginia. Taylor won the Bancroft Prize, the Beveridge Prize and the Pulitzer-Prize in 1996 for his book William Cooper’s Town: Power and Persuasion on the Frontier of the Early American Republic. In 2014 he won the Pulitzer-Prize again for his book The Internal Enemy: Slavery and War in Virginia: 1772-1832. Published in 1882, when Roosevelt was only 23 years old, this book discusses the naval battles and technology used during the war. Roosevelt chronicles the events of the war from the very beginning starting with the social climates in both Britain and America before the outbreak of the war and discusses the naval battles of the war as they happened each year. In doing so, Roosevelt discusses both sides strengths and weaknesses and analyzes the performance of the crew and commanders in each battle. The book was well received when it was published and, in 1886, the navy placed a copy of the book on every U.S. navy ship. The book was so popular in Britain that, in 1901, Roosevelt was asked to write the War of 1812 section of the official history of the Royal Navy. Roosevelt later became the Assistant Secretary of the U.S. Navy and eventually became President of the United States in 1901. Roosevelt went on to write 35 more books, which were about many different topics such as history, nature, hunting and travel. Some of these books including his autobiography, his memoirs on Cuba and his time leading the Rough Riders, a biography on Oliver Cromwell and a guide book titled New York: Historic Towns. Published in 2004, the book discusses how the War of 1812 unified the country with a renewed sense of purpose and paved the way for westward expansion. The book documents the major events of the war from the very beginning to the very end at the Battle of New Orleans. In addition, the book argues that the Americans acted disgracefully during the war because although the American grievances against the British were legitimate, the main reason the “war hawks” in America pushed for the war was to capture Canada from the British and Florida from the Spanish. Walter R. Borneman is an author and lawyer who has written numerous history books about the 17th and 18th centuries such as The French and Indian War: Deciding the Fate of North America and The Admirals Nimitz, Halsey, Leahy, and King – the 5-star Admirals Who Won the War at Sea. 5. The War of 1812: A Forgotten Conflict by Donald R. Hickey. Published in 1989, the book is a comprehensive look at the War of 1812 and explores all aspects of the war including the military, domestic and diplomatic history. The bicentennial edition includes additional information on how the war promoted American nationalism and manifest destiny, stimulated defense spending and enhanced America’s reputation abroad as well as sparked conflicts between pro-war Republicans and anti-war Federalists, negatively affected the American Indians and solidified anti-British sentiments in the U.S.
Hickey is a professor of history at Wayne State College in Nebraska. Hickey is an award-winning author who has written a number of books about the War of 1812, including Don’t Give Up the Ship! Myths of the War of 1812, the War of 1812: A Short History, the Rocket’s Red Glare: An Illustrated History of the War of 1812 and 187 Things You Should Know About the War of 1812 and he is also the editor of the John Hopkins Books series on the War of 1812. Hickey won the Samuel Eliot Morison Award from the USS Constitution Museum in 2013. Published in 2013, the book tells the story of the War of 1812 from the side of the British. Using firsthand accounts from eyewitnesses, it recounts when the British invaded Washington and set fire to the White House in the summer of 1814. Although the book focuses on a very specific event and time period during the war, it also discusses how the War of 1812 overall highlighted the weaknesses and strengths of both sides: the British Empire, which was overstretched and arrogant but powerful and experienced, and the young American republic, which was small and struggling with internal conflict but brave, bold and fiercely patriotic. Peter Snow is a BBC correspondent and author who has written numerous other books about British history such as Treasures of British History, To War with Wellington, Battlefield Britain and Twentieth Century Battlefields. Published in 2010, the book discusses the naval battles of the War of 1812 and explores how the tiny American navy took on the all powerful British navy. The book discusses how the Americans used bravery and brilliant strategies to overcome the British. The book argues that the war taught the British a valuable lesson about the power of the underdog and it forever changed naval warfare and ensured that Britain would never interfere with American trade relations again. Stephen Budiansky is a journalist and author who has written multiple books about military history including Battle of Wits: The Complete Story of Codebreaking in World War II and the Bloody Shirt: Terror After the Civil War. Published in 1998, the book discusses the British attack on Washington in the summer of 1814, which Pitch says is a forgotten aspect of American history because it was humiliating and embarrassing for the U.S.
During the attack, the British set fire to the White House, the Capitol Building and many other important buildings in the city and forced the President, James Madison, to flee the White House and the city. The book argues that through the various American triumphs in the war, America earned the genuine respect of the British in the end. The book details how the British landed in Patuxent River in August of 1814 and then marched into Washington, took over the city and began burning public buildings. Pitch explains that the situation was made worse by the Americans lack of defense against the invaders due to the local militia’s inexperience, outdated equipment, and overall lack of preparation for war. Despite the British triumph in Washington, the book describes how their victory was short lived when their attack on nearby Fort McHenry, in Baltimore, failed, which inspired Francis Scott Key to write the Start Spangled Banner, and how the attack on New Orleans several months later also failed, which marked the end of the war. Anthony S. Pitch is a former journalist who now leads walking tours in Washington D.C. and is considered to be a local history icon in the city. Pitch has written numerous history books including Our Crime Was Being Jewish: Hundreds of Holocaust Survivors Tell Their Stories; The Last Lynching: How a Gruesome Mass Murder Rocked a Small Town; They Have Killed Papa Dead! : The Road to Ford’s Theater, Abraham Lincoln’s Murder, and the Rage for Vengeance. In 2001, Pitch won the Arline Custer Memorial Prize for his book The Burning of Washington and won the prize again in 2009 for his book They Have Killed Papa Dead! Both books also won the Maryland Historical Society’s annual book award as well.